Since last reviewing my top Bulgarian wines, there has been more and more competition in the world of Bulgarian wine. Some prices have come down, including my favourite, the top Enira 2007. Now 16 lev at Metro. But it’s hot and sunny here, and I’ve become attached to some more than acceptable rose´ wines. Summer rose wine drinking serve three roles for me. They work as an aperitif, they please most when combining with food such salads, fish, cheese, bob and light summer dishes. And the ladies seem to like the pink colour. Pour yourself something cool, and, if in Sofia, try the 1.5 litre jugs of homemade lemonade (10 lev) on BeSo’s be seen terrace. Failing that, and if in the office, then transport your mind to your favourite summer memories. 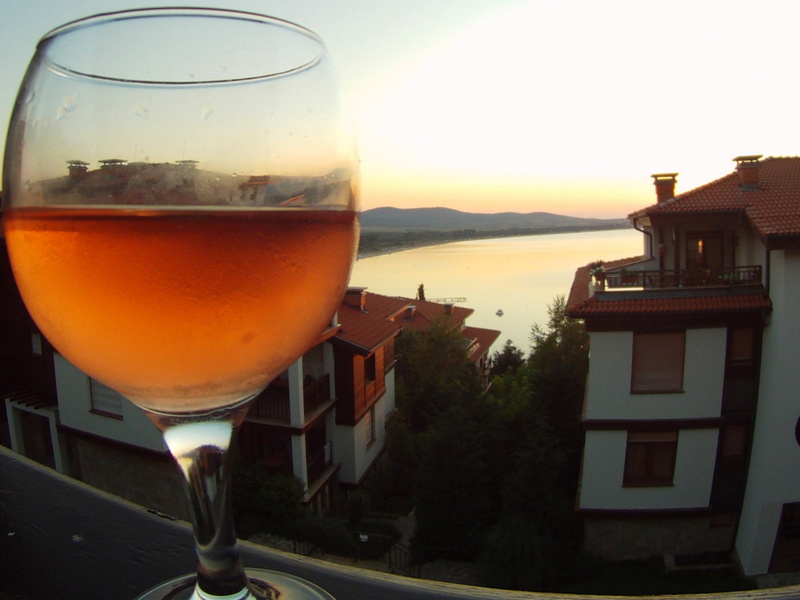 Wherever you are, Bulgaria’s role, in the once frowned upon world of rose´ (or blush wine as it was called), looks like its here to stay. The rose´wines have evolved wonderfully, and there ar every few, if any, undrinkable rose´s being sold. Here are my top three and all are widely available in Bulgaria. The winner leads by a country mile (or rather kilometre), if a trip to Metro is made. As the No Man’s Land Gold Rose, from Damianitza is half price right now. It’s just 5 lev. This is makes it doubly easy to share this one with friends. In these wonderfully warm evenings this wine cuts the mustard served very chilled. 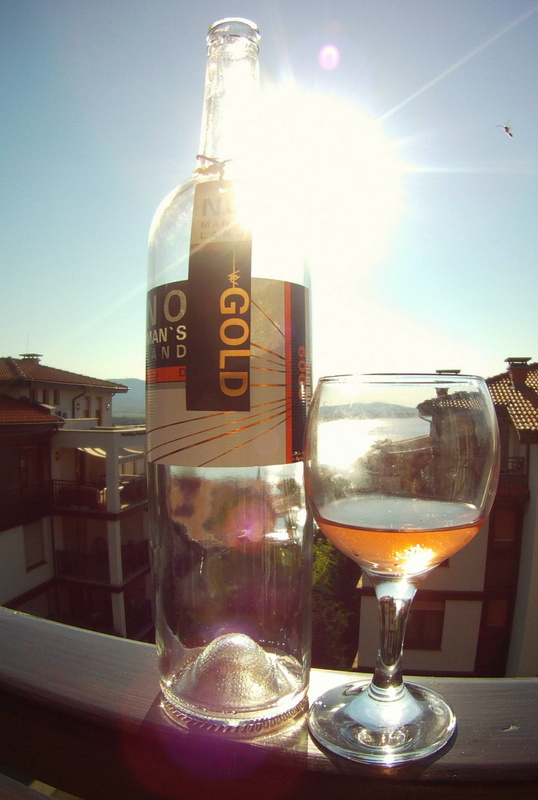 But make no mistake, this No Man’s Land Gold Rose is top value rose wine at the normal price (outside metro around 12 lev). So in simple terms this is a Rose wine with flavour. Logodaj, For simple cheap quaffing. A Pink Party? Logodaj Melnik Rose wine makes no demands on the drinker. Simple, affordable (6 lev) and fresh. This blended rose comes with a sensible screw cap. An unassuming, bog standard rose´. Not offensive, but not earth shatteringly amazing; just a very affordable everyday rose wine. The Logodaj winery has been producing some excellent red wines at decent prices, so I was particularly keen to sample their pink offering. I was wondering if this could be a way of getting rid of excess wine — rose´ has a reputation for lack of care. However, no sign of poor wine here. This is a fresh rose´, that as far as my memory servies me, outstrips the cheaper ones found from other countries. Errrr… I’m, not sure about the over top marketing speak; but the Logadaj wines are worth trying, and this simple rose is unlikely to disappoint. If you need a better quality rose, then try the 16 lev Logodaj Nobile Rose´. 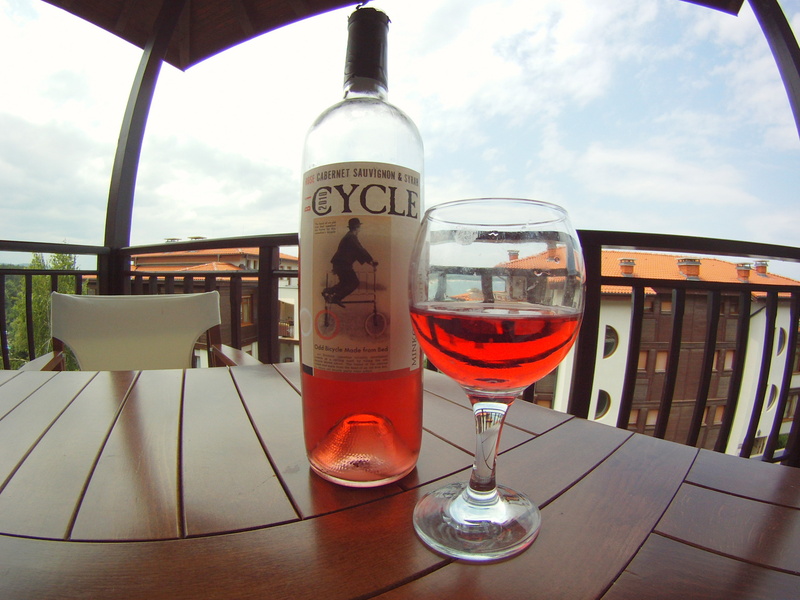 The huge success of Cycle wines is down to what, some would say, is heavy marketing. But, for me, the Minkov Borthers wines are well priced, available everywhere — and consistent. I have praised their Gewurztraminer for its easy drinking as well as their Chardonnay/Colombard, their Sauvignon Blanc is excellent value for the money. This rose´is closer to the medium priced end at around 7 lev to 9 lev. But in my view, it’s a fair price. This rose´accompanied my indian curry recipe nicely, and will probably match even better any sweet and sour Chinese dish. I have to confess I am a convert to rose´wines. Perhaps it is the association with happy times in Paris that makes it the default choice for summer quaffing. As rose´wines are widely available, this year it seems there is a fashion to be seen ordering a rose´ wine in a more upscale bar or restaurant. And like so many things here, being considered fashionable holds the key to sales. Nazdrave. Tip Of The Day: Last minute bookings being taken on homes to rent in Bansko for the Jazz Festival. Including the luxury Bell Tower Apartment. FLIGHTS: cheap flights to palma mallorca are still available for local readers looking for holidays outside BG. You should try the Project Rose from Dragomir winery. It was recommended in a restaurant we visited and it is so delicious, strawberries being a strong flavour. Perfect!